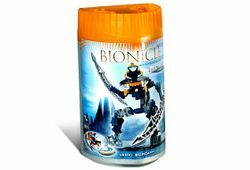 8615 Bordakh is a BIONICLE set released in 2004. The set includes the Bordakh itself and a Kanoka disk. If the set was bought at Wal Mart during a limited time offer, it would come with the Vahi, which is the Mask of Time, and the Disk of Time. Squeezing the sides of the disk launcher when a disk is in it will launch the disk. The Bordakh can be combined with Zadakh and Keerakh to make a Kraahu. This is a description taken from LEGO.com. Please do not modify it. (see an archive of the product's page) Closing in for the capture! Ga-Metru is home to the Bordakh, the most cunning of all Vahki. The Bordakh love the chase and will sometimes delay a capture just to extend the thrill of pursuit. Their Staffs of Loyalty temporarily turn Matoran into spies for the Vahki. Includes Kanoka disk launcher and glow-in-the-dark disk. Closing in for the capture! Ga-Metru is home to the Bordakh, the most cunning of all Vahki. The Bordakh love the chase and will sometimes delay a capture just to extend the thrill of pursuit. Their Staffs of Loyalty temporarily turn Matoran into spies for the Vahki. Includes Kanoka disk launcher and glow-in-the-dark disk.